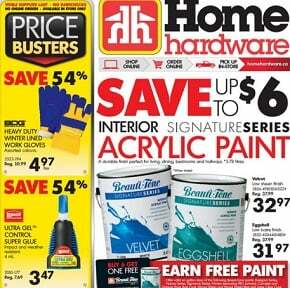 Current best savings from the Home Hardware flyer: $32.97 Velvet Interior Acrylic Paint; $18.74 each 1.2 Gal. Warm Mist Vapourizer; $27.97 each 1.7 Litre Cordless Jug Kettle; $11.97 each 100 Pack Disposable Latex Gloves; $47.97 each 100% Acrylic Cabinet & Furniture; $47.97 each 100% Acrylic Trim & Door Silk; $59.97 17″ Ceramic Tower Heater; $37.97 each 1875 Watt Ceramic Ionic Hair Dryer; $23.97 each 24 Pc. Premium Haircutting Kit; $22.97 each 26″ Snow Shovel with Ergo Handle; $10.37 each 3 Pc. Brush Set; $24.97 each 3 Qt. Slow Cooker; $19.97 3-in-1 Spiral Slicer; $62.97 each 4 1/2″ Angle Grinder; $10.97 each 4 Pack Lint Free 9.5″ Roller Refills; $34.97 each 4 Slice Toaster with Retractable Cord; $3.27 each 48″ Daylight Fluorescent Tube; $67.97 each 5″ Random Orbit Sander; $10.97 each 6 Pc. Fabric Paint Roller Kit; $29.97 each 6 Speed Blender; $7.97 each Pack 8.5 Watt LED Light Bulbs; $69.97 each 80 Pc. Socket Set; $209.9 Aberdeen Bathroom Cabinet Collection – 2 doors, 2 drawers; $79.97 Aberdeen Bathroom Cabinet Collection Wallette; $49.97 each Alligator Chopper/Slicer Kit; and more. Find all deals and offers in the latest Home Hardware flyer for your local store.